It was a solo lunch, and I was on a quest to judge Long’s Noodle House on Main Street near 33rd (right beside Au Petit Cafe) by sampling just one dish — their famous xiao long bao (XLB). They’re listed as “25. Steamed Mini Pork Buns” on their menu. Just kidding. They look great. Almost translucent skins. Their vinegar, soy sauce, and ginger dipping sauce. I like the snappy balance. Predominantly vinegar, then soy, then ginger, then a bit of funk. A bit saggy but still plump. The wrapper really sticks to dry chopsticks, so maybe lick your chopsticks or dip them in tea before picking up a dumpling or risk tearing a hole in these fun bags. Quite thin and strong wrappers on these! Clear, aromatic, and flavourful soup. Texture of the filling was spot on. Not mushy and not too firm. Just right. The main difference I see between these and Wang’s is that the pinched part at the top isn’t as thick in Long’s xlb. It’s just enough pinched dough to keep it closed, plus a touch more for insurance. The pinched part at Wang’s is a bit too thick. 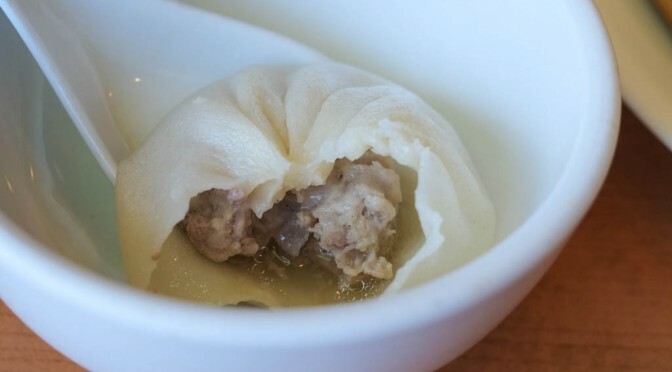 I sucked the soup out of the first three dumplings (according to mainstream XLB-eating technique), then popped the rest whole into my mouth so I could bite through and experience the gush of warm, tasty soup flooding into my greedy mouth. Yessssss. Fun bags… ha ha ha.